Comprehensive electronic horizon solution for accurate and up-to-date information about the road ahead. Vehicles and drivers greatly benefit from information beyond the sensor horizon for a safer and more comfortable ride. EB robinos Predictor provides highly accurate and up-to-date information about the road ahead for predictive, ADAS, and automated driving functions. Our offering consists of two core components, both supporting ADASISv2 and ADASISv3: EB robinos Provider to make the most recent SD and HD map data available and EB robinos Reconstructor to reassemble and efficiently store relevant electronic horizon data. In 2018, EB was awarded with defining the reference implementation of the ADASISv3 Provider and Reconstructor by the ADASIS forum. We work together with leading map providers such as HERE or TomTom to provide the most suitable solution for your specific needs. By supporting the latest map material (for ADASIS v2 and v3), Elektrobit also provides an out-of-the-box ADASIS Provider for your R&D activities: the EB robinos Predictor Eval Kit. Using a GNSS receiver as positioning source and recording/replaying test drives, the kit contains everything that is necessary to run EB robinos Predictor instantly within your development environment. EB robinos Predictor allows you to provide electronic-horizon-based functions to your customers for a comfortable and efficient driving experience: from curve-speed warning or traffic sign display to paving the way for automated driving features like a highway pilot. EB robinos Predictor combines navigation SDK and driver assistance software as well as back end capabilities and covers predevelopment as well as mass production. With this complete offering car makers and suppliers can benefit from EB’s expertise in navigation and driver assistance. EB robinos Predictor supports EB’s driver assistance development platform, EB Assist ADTF, and a wide range of other driver assistance platforms from various suppliers. You can produce an electronic horizon on any navigation system and integrate map data into any ADAS electronic control unit. 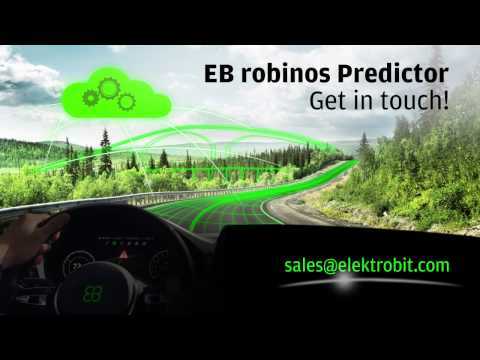 This short video demonstrates how EB robinos Predictor enables ADAS functions. Target-ready, mass production software to make the most recent map information available. Auxiliary provider enables an extension of the ADASISv3 stream with dynamic information such as traffic incidents, weather, or Car2X data. Target-ready, mass production software that reassembles and efficiently stores relevant electronic horizon data. A robust out-of-the-box ADASIS Provider for your R&D activities. Solutions for mass production—Broad experience, proven standards, and innovative engineering methods for up to Level 5 of automated driving.